Join the Tweetstorm #QatarDeceit Qatar Dolphin & Research Stop Sponsoring the Taiji Dolphin Slaughter by purchasing Blood Dolphins! On September 1, 2013 the terrible dolphin drive made famous by the academy award-winning documentary “The Cove” began yet another season capturing and killing dolphins and small whales in Taiji, Japan. The Taiji Fisherman’s Union have made and agreement with the World Association of Zoos and Aquariums (WAZA) not to slaughter bottlenose dolphins during the month of September. Buyers of the blood dolphins can then claim no blood was spilled for their collection. The WAZA agreement does not extend to other species. 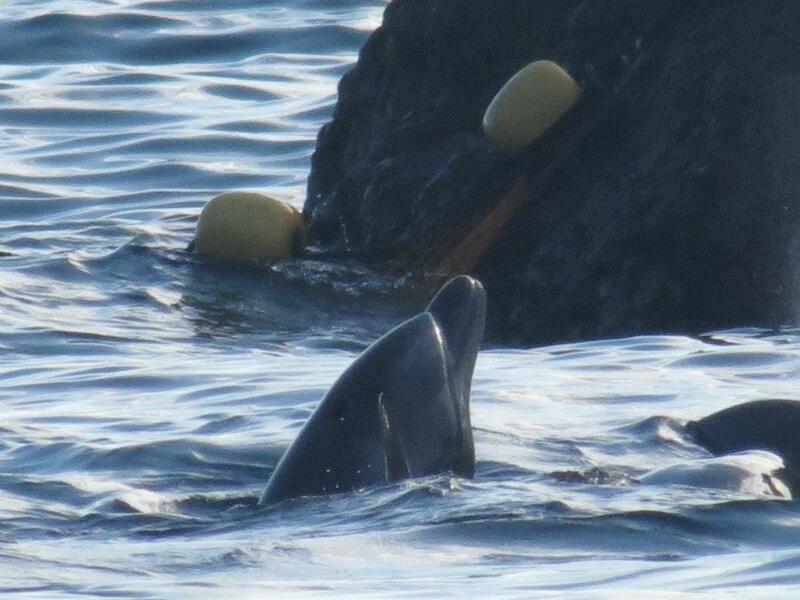 Between September 1st and September 17th 181 dolphins have been driven into the cove. of these 18 were captured (bottlenose), 31 slaughtered (pilot whales and 1 bottlenose dolphin). A total of 121 were released. 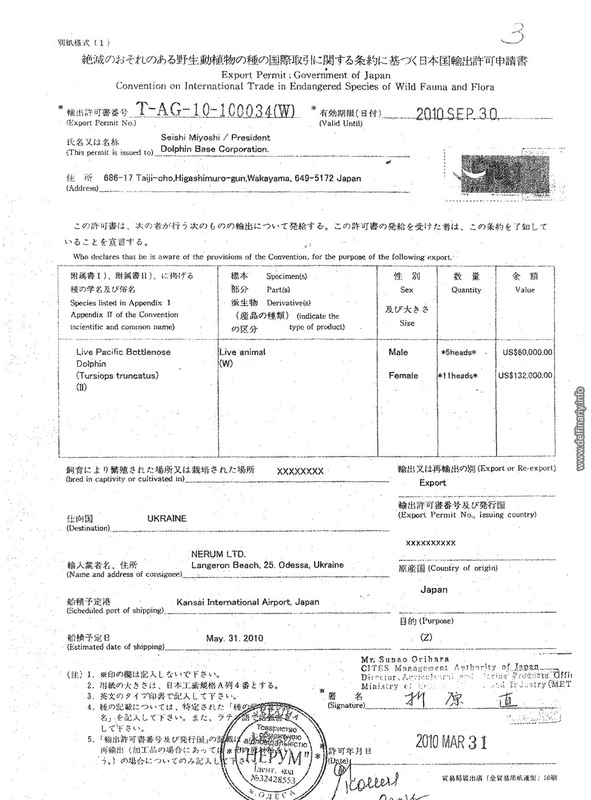 Once September passes the WAZA agreement no longer applies. Bottlenose dolphins unwanted for aquariums and marine park display will again be openly slaughtered. On September 18, 2013 following several bloody days at the cove for pilot whales, and a constant transfer of young bottlenose dolphins for aquariums Op-Ed blogger Elizabeth Batt published a shocking article:“Op-Ed: Is NatGeo sponsoring company that purchases Taiji dolphins? 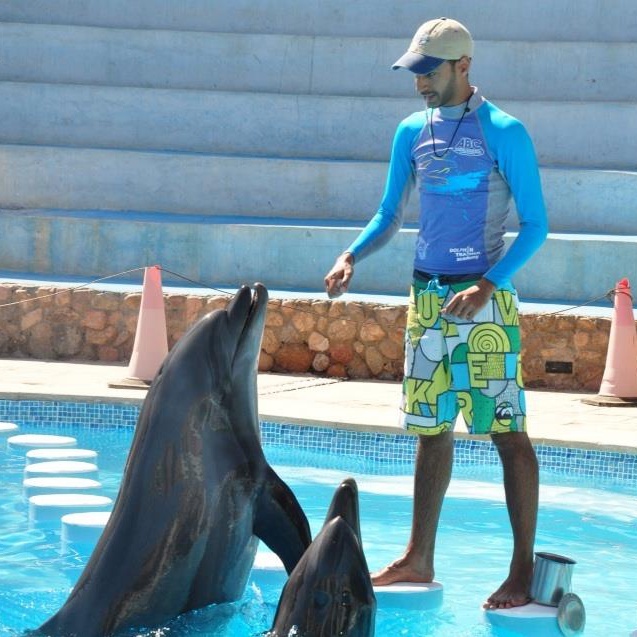 Qatar Dolphin Discovery Research run by, NEMO or Nerum LLC. They announced on their Facebook page, “Good morning people, we are back with some exciting news, Qatar Dolphin Discovery Research is a proud to be sponsored by National Geographic! 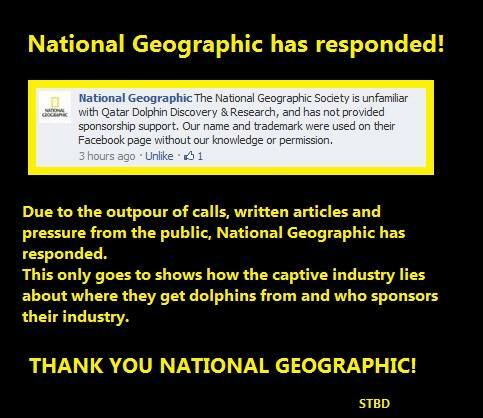 After a Tweetstorm had been planned National Geographic came forward and made it clear that Qatar Dolphin Discovery & Research had used the National Geographic logo without their permission and that they were not Dolphin Discovery & Research sponsors. 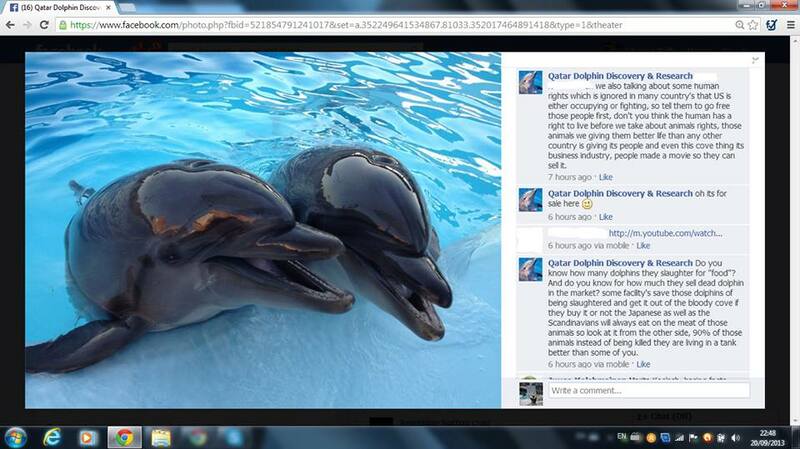 Qatar Dolphin Discovery & Research Screen Shot Facebook U.S. Access now blocked. Since the activities and involvement of Qatar Dolphin Discovery & Research have come to light the company has blocked U.S. access to their Facebook page. They continue to rant that they are saving the purchased dolphins from slaughter when in fact the capture and sale of bottlenose dolphins and a limited number of other species to the captive industry keeps the drive alive.“The drive hunters cannot sustain their business on dolphin meat sales – they must capture and sell dolphins to keep it thriving. Captivity kills, and Taiji is proof of that premise”. “Documentation shows that “Given that Nero/Nerum LLC has purchased dolphins captured from the inhumane Japanese dolphin drives”. 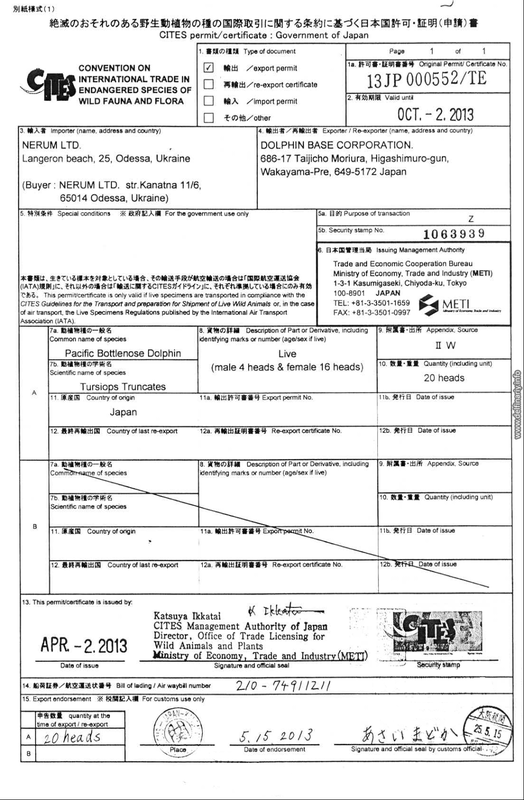 This CITES export permit dated Sep. 30, 2010, clearly shows that Nerum imported five male and one female Pacific bottlenose dolphins from Dolphin Base in Taiji, Japan. Even more recently, just last May in fact, Nerum acquired another 20 Pacific Bottlenose from the same facility, as this CITES permit shows. The company accepted delivery of a further 16 female and 4 male Pacific bottlenose dolphins”(source). “Training, training, getting ready and getting closer”. 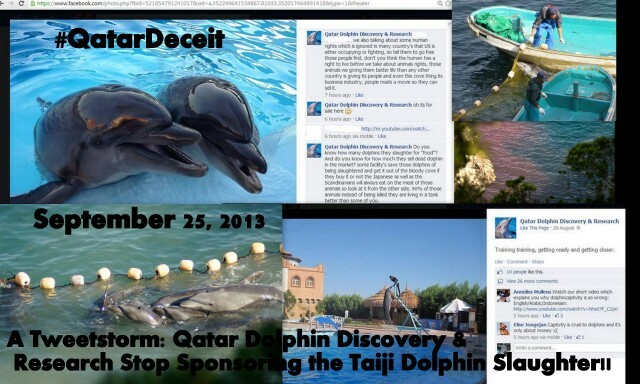 Qatar Dolphin Discovery Research US Access now Blocked. Screen print taken in the UK. TWEETSTORM on September 25th to tell Qatar Dolphin Discovery & Researchwww.facebook.com/QatarDolphinDiscovery (link is not visible in USA) that dolphin slaughter is not acceptable and we will not stop until the slaughter and taking of dolphins into captivity stops! LIST OF PRE-MADE TWEETS will be available shortly before the tweetstorm. Please support this important event by inviting your friends to join, many thanks !! This entry was posted in Beluga Whale, Cetaceans, Hector's and Maui's dolphins, The Daily Scoop and tagged Bottlenose dolphin, IMATA, Japan, Qatar Dolphin Discovery Research, QatarDeceit, Taiji Wakayama, the Cove, WAZA, World Association of Zoos and Aquariums by Kirsten Massebeau. Bookmark the permalink. las carnes de envasados marinos cae por su propio peso ,no son saludables en ningun aspecto,,asi mismo caera la venta de delfines para la esclavitud en parques del comercio de diversion,,porque no es sano para la nueva y digna educacion.